This set of Basic HTML Questions and Answers focuses on “Scalable Vector Graphics”. 1. Which of the following is not the property of SVG images? Explanation: SVG images stands for Scalable Vector Graphics which are scalable, zoomable and resolution independent. SVG is an open standard. 2. _______ drawings can be dynamic and interactive. Explanation: Scalable Vector Graphics (SVG) is an XML-based vector image format for two-dimensional graphics with support for interactivity and animation. The SVG specification is an open standard developed by the World Wide Web Consortium (W3C) since 1999. SVG images and their behaviors are defined in XML text files. 3. Which of the following is the predefined shape elements that can be used by developers? Explanation: SVG images stands for Scalable Vector Graphics. Path <path> is used to define path. Rectangle element draws rectangle and Circle <circle> draws circle in SVG. All of the respective SVG elements are used to draw respective images. 4. Which element must reference a resource that can provide an image for the cursor graphic? Explanation: The cursor attribute specifies the mouse cursor displayed when the mouse pointer is over an element. This attribute behaves exactly like the css cursor property except that if the browser supports the cursor element, you should be able to use it with the funciri notation. 5. Which element serves as a container for atomic filter operations? Explanation: Composition of two images together is done by a primitive filter called feblend. A filter is referenced by using the filter attribute on the target SVG element and is never renderd directly. Fetching of image data from external sources is done by feimage. 6. The __________ element must reference either an ‘altGlyphDef’ element or a ‘glyph’ element. Explanation: Src is the URL of image. The href is Hypertext Reference which is used to link pages in html and is also an attribute for anchor tag. The altGlyph element allows sophisticated selection of the glyphs used to render its child character data. 7. The ___________ element must reference a ‘linearGradient’ or ‘radialGradient’ element. Explanation: Script is line of command which are executed by script engine. Allowing animation to control translation, scaling or rotation is done by animateTransform element. A radialGradient lets authors define radial gradients to fill or stroke graphical elements. A clipping path is defined by clip-path element. 8. SVG also stands for Scalar Vector Graphics. Explanation: SVG stands for Scalable Vector Graphics. 9. Which property of SVG restricts the region to which paint can be applied? Explanation: Allowing animation to control translation, scaling or rotation is done by animateTransform element. A clipping path is defined by clip-path element. A clipping path is defined with a clipPath element. A clipping path is used/referenced using the clip-path property. A radialGradient lets authors define radial gradients to fill or stroke graphical elements. 10. Which SVG element produces the same effect as if the nodes were deeply cloned into a non-exposed DOM? Explanation: A colour of line, text or outline is defined by stroke element in SVG. The use element takes nodes from within the SVG document, and duplicates them somewhere else. 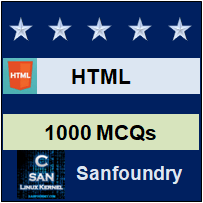 To practice basic questions and answers on all areas of HTML, here is complete set of 1000+ Multiple Choice Questions and Answers.